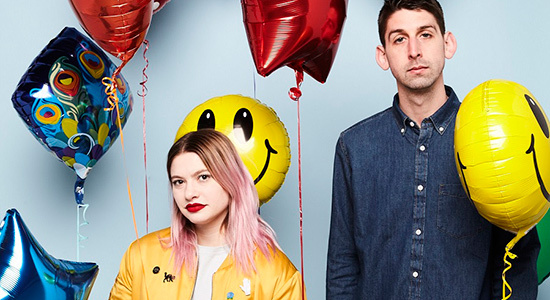 Tigers Jaw returns with new record Spin, a glowing set of pop/rock tunes that denotes a shift in the band’s timeline. As the first release for producer Will Yip’s Atlantic Records imprint Black Cement, Spin is Tigers Jaw at its most composed and polished. But the band still builds upon its penchant for dizzying, unexpected hooks and bare, honest songwriting. Brianna Collins and Ben Walsh discuss the world around their record, from their new label to the newfound sense of hope and perseverance that really sets Spin apart from the rest of their catalog. I wanted to start off by asking how you would describe Spin in relation to Charmer in terms of sound? Brianna Collins: We definitely had a lot more time than we’ve ever had with previous records to really think about song structure and the keys that songs are in, so in the end it made everything feel really cohesive with there still being variation. Ben Walsh: Yeah, we just had a lot more time. Also, writing Charmer, it was at a busy time in our lives when we weren’t really doing the band full time and we were writing on a much tighter schedule. This time around, for Spin, we’ve taken the band full-time and we’ve toured a whole bunch, and then we took some time off from touring specifically to write. It just felt really nice to have no pressure at all and just write and see what came naturally. We were very fortunate to have that time available to us. Another big change is that Brianna has written some songs for Spin, and she hasn’t been a primary songwriter for the band before. So that was a big shift, but she did an awesome job with it, and we’re really excited about how her songs came out. You mentioned that you took some time off to write the record—about how long would you say it took to compose it? Walsh: I wrote intensively for about two months, and then there were a couple more months where I was doing different things or I was on tour with different bands and I was writing in my spare time. So the bulk of it was probably done in like two months or so. You signed to a new label, Black Cement, for this release. Timeline-wise, did you know before you went in to record the record that you were going to a new label? Or a major label? Collins: No, we didn’t know that we were going to be signing, especially not with a major label. Walsh: We knew our contract with Run For Cover was up; we had done three albums with them and a bunch of other splits and EPs and stuff. 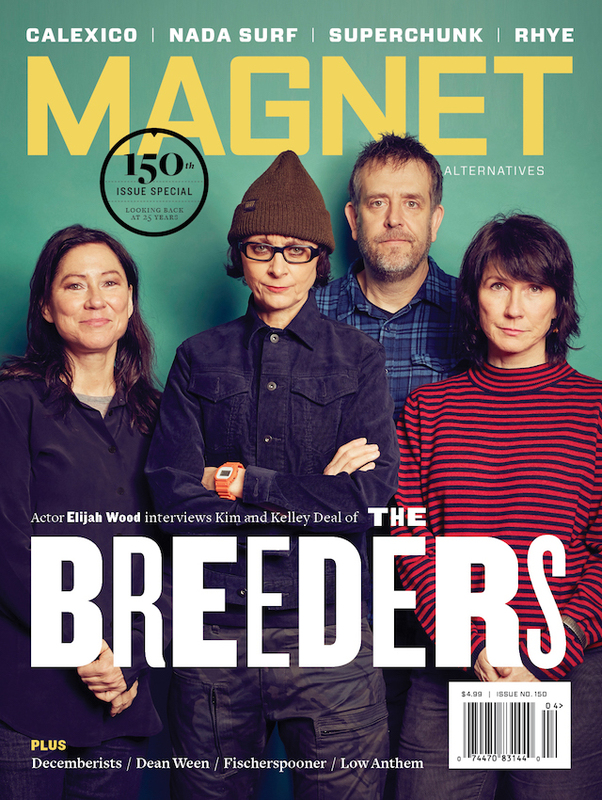 And we reached a point—you know, we’ve been doing this band for more than a decade now, and we were like, “Well, maybe we can ask around and see if there’s interest in other places and try to expand a little bit.” And it felt like an appropriate time in the band’s life to try and switch things up a little bit. We were talking to a couple of different labels, and we had a really, really difficult decision. But, ultimately, we felt really comfortable moving forward with this new label called Black Cement Records. Initially, when we were first approached, we were definitely skeptical because we have no direct experience with major labels and we’ve only heard stories—some of them horror stories—from other bands. We were kind of like, “Well, we’ll hear them out and see what they’re all about and see what they’re trying to pitch to us.” The funny thing is, the record was actually recorded before we committed to any label. So the record is exactly how we wanted to do it, with no label influence and total creative freedom, so we’re really proud of that. Shortly thereafter, it came time to make a decision about who would release this, and the staff at Black Cement just kept showing us time and time again how invested they are, how motivated they are, how much they believe in what we want to do. How much they want to use their resources to bring what we do to a bigger audience, not change us to fit their mold, but change what they do to amplify what we do. Which was really exciting. I always think of Jimmy Eat World in those situations, the Bleed American kind of story where they record without a label. That ended up being a really successful record, so let’s hope it’s a similar story. Walsh: Fingers crossed that we can follow in their footsteps. But we feel really happy with how the record came out and really proud of it. We’re helping people feel the same. Spin seems to take a much different route lyrically than Charmer did. This record seems a bit more positive, more self-affirmed. Walsh: Definitely. I would say that there’s an element of hope in the lyrics that wasn’t fully there before. And I’d say that just comes with living life and going through all sorts of really difficult relationships and changes and kind of realizing, “Oh, well, I’ve gotten through this much. I can do this.” There are definitely some more morose lyrics on the record, but there is an element of hope or some sort of confidence from the ashes. Collins: That was good, “confidence from the ashes”! The record is quite a bit different production-wise as well—a bit more polished than ever before. Will Yip produced the last two, correct? Walsh: Charmer and Spin, yes. I think one of the biggest differences was that Charmer was tracked in less than a week. And we did it in blocks of instruments, so we did all the drums and then we did all the bass, you know. We sort of just did it as quickly as we could because we had a limited amount of time to do it. This time around, we had a full month to record everything. So we basically implemented a song-by-song schedule where every day or every two days we would be working on a different song. And we would start on the drums and then lay down the bass and start laying down the guitars, and by the end of the night, we’d be working on vocals. It was really cool for us to get to tailor all the tones and all the performances and all the sounds specifically to each song, instead of just worrying about the five other guitar tracks to get done today. I think that that allowed us to develop a much more cohesive sound overall. And each song has its own identity but everything fits together as a whole because it takes up the appropriate amount of space on the record, I think. I know this can sometimes be out of your hands, but I was wondering if you had a say in picking “Guardian” as the first single? Collins: Yeah. One of the great things about working with Black Cement is that they really trust our judgment with the decisions we have to make as a band. And Ben and I both strongly believed in “Guardian” as the first single. And when we told that to them, they were like, “Yeah, of course.” It’s been great to get to work with them. Walsh: It’s been really easy getting on the same page with them because they have so much trust in us and they’re really proving to us that we can trust them as well, so it’s a really great working relationship. They’ve really proven to us how much they believe in what we do. That’s pretty great that you still have control over stuff like that. I always think of that as so important, thematically and sound-wise, that first thing you get to hear. Walsh: It’s the most important. Like I said earlier, we were skeptical when this was all first brought up because we thought, “Oh, if we sign to a major, we’re gonna have to play by their rules and we’re gonna have to change a lot of things around about what we do.” So we weren’t really looking to do that. But the more meetings we had with them and the more time we spent with them, we realized that they’re not trying to mold us into something that we’re not. They’re trustful of what we do and they’re respectful of what we do. So it’s been awesome to have the same amount of creative freedom that we’d have on any other independent label. So, let’s talk about the art work. Who is the artist? Walsh: Brianna’s done all of our cover arts. Collins: Going into it, I knew that I wanted to try doing a painting. Specifically an acrylic painting because for every record I try to use a different medium or explore something further. With that in mind, I didn’t necessarily want the album art to be representative of one line of a song or even the album title. I wanted it to be something that represented Ben and I coming together to make this thing. In art school, I took a painting class and you would walk into the room and it would be this random still-life setup of things that you would never put together on your own. So I had Ben choose a couple objects and I chose a couple and I put them together, photographed them in still-life, and then painted that. So it represents this being our record, but it doesn’t have meaning in relation to the record title or the songs. What about the name? There’s a line in “Window,” but is there a reason that word Spin stuck out to you? Collins: I feel like naming your record is one of the harder parts of putting it out. At least for me, I would listen to the songs and try to find something that represents a feeling or something thematic that was present throughout the record. And “spin,” especially the way it is in the lyrics of the songs that it comes from, because it’s in a couple songs, it’s just a word that represents a feeling that can be overwhelming, whether it’s good or bad. It just encompasses how you’re feeling in that moment, like if it’s crazy or overwhelming—that’s what I got out of it and that’s how I related to it. Ben, I don’t know if it’s different for you. Walsh: Definitely, it’s just like an overwhelming feeling where you sort of lose your bearings and don’t now what’s up and what’s down. And it did kind of pop up in a few songs and the meaning that it carried, being overwhelmed and being out of your element because of something that’s happened to you. Ben, I read recently that your favorite record is Saves The Day’s In Reverie. So, Brianna, what’s your favorite record? Collins: Ha, well that’s my favorite Saves The Day record for sure. Is In Reverie your favorite record ever, Ben? Walsh: Yup, In Reverie is my favorite record of all time. Collins: I think a record that I’ve consistently listened to literally since the moment I got it, like I’ve listened to it every year since I’ve had it, is Plans by Death Cab For Cutie. I listen to that so much. Collins: Or Brand New Eyes by Paramore. They’re probably tied. It’s interesting because Plans and In Reverie are both the big major-label jumps for their respective bands. So it’s good timing. Walsh: That’s true. Well, it didn’t work out the best for In Reverie, because they did get dropped. [Laughs] So hopefully that’s not gonna happen to us. We have enough people that are looking out for us. So Charmer had some Twin Peaks references. Are you both excited for the revival? Collins: I feel like I can’t stop buying Twin Peaks merchandise. I got Ben this throw rug thing … Or is it like a blanket? It was in the Showtime store, but it’s literally like the Black Lodge red with the floor pattern. Walsh: We’re very excited. I know there are a lot of people that are skeptical about how true it’s gonna be to the feeling of the first two seasons, but as long as David Lynch is involved and working on it, I feel like he won’t let its legacy be tainted. I feel great about it, I’m gonna watch it no matter what. But it comes out while we’re on tour! Collins: We have to get Showtime so we can watch it together. Walsh: We have to figure out a way to watch it on the road. I feel like it can’t get as bad as the middle of season two. Walsh: You have to really hang on and push yourself through it. It comes back in a very big way. There are bright moments throughout the middle of the second season, but it definitely puts viewers to the test a little bit. Do you each have a favorite song from Spin? Collins: Well, my favorite song that Ben wrote is “Escape Plan.” I don’t know, I think all of Ben’s lyrics are really honest, but you really feel something from the song when you listen to it. I really love how we did that song, the dynamics of it are really cool to me, the way it builds. The harmonies that we did, all around I really just love that song. Walsh: One of my favorites, and I will pick one of Brianna’s songs—I think “Same Stone” came out really awesome. I think it’s a completely different vibe for the band but in a really cool way. It really showcases her piano playing, her vocals. When it was first being written, we didn’t know exactly how it was gonna turn out dynamically and Will Yip did an amazing job engineering it. And the performances that Brianna did were awesome. It just came out really great—I think it adds this new flavor to the album that none of our previous stuff had before. Any other thoughts you’d like to leave us with? Walsh: I just want to give Will Yip a little bit more credit for bridging the gap between this major-label world and the scene that we’re more familiar with. He’s the one that first developed the relationship with the people at Atlantic, with Fueled By Ramen and Roadrunner. The bands that he is close with and loves, he always has their back and tries to help them out in any way, and he would never steer us in the wrong direction. He was really instrumental in starting this relationship, and he is involved with the label itself and is doing a lot to ensure that we have the creative freedom that we want and need.